The embroidery of personalised bibs is a great job ! Each bib is unique , because the parents have a choice of symbol, colours and layouts . 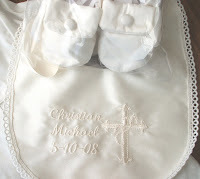 My baptismal bibs are lined with water resistant layer. Usually ,the same matching guipure / venise trim (as in the purchased christening gown) is used to finish bib's edging. Double sided satin ribbon compliments the quality of the final product. These are just gorgeous! What a perfect accessory to match and protect the gowns! Your work is just exquisite!... oh and you asked about me thinking of selling christening gowns. I got as far as making a prototype, then we left England and life here took over. I recently gave this prototype to a friend for her granddaughter's chritening. It was an oystershell pink dupioni with white lace bodice.